Beer and meat; meat and beer. I’m starting to come to the beautiful conclusion that these two things were meant to be together. The result? It worked; it worked SO WELL. Prior to submerging my beef into my IPA (I chose Double Trouble Brewing Co.‘s Hops and Robbers – from Guelph, ON) I made a slightly sweet, mostly smoky dry rub. I don’t know if it’s silly to use a dry rub prior to marinating. I mean, it kind of seems like defeating the purpose of a dry rub if things are going to get wet, but whatever. I’m a rebel without a cause culinary degree. I’m sure my BBQ master fiance will shake his head, but it’s all good. My theory was that if I massaged a rub into the meat, the flavours would cling and embed themselves into the flesh as the meat soaked – seems legit. I marinated the flank steak overnight and after grilling it the following day, I feel as though the dry rub wasn’t a waste after all. The meaty juices were totally drunk on hops while the exterior carried out a nice smoky flavour. I say go either way – what matters most is that your steak is jacked up with beer. 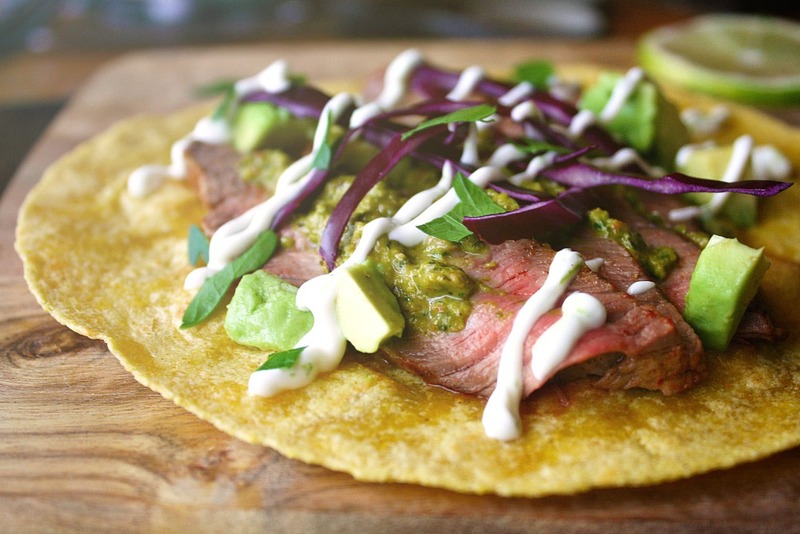 To dress up the meat, I made a lime and chipotle chimichurri – you can find the recipe for it here. I also whipped up a simple lime sour cream to drizzle on top by mixing 1/2 cup sour cream with 1 tablespoon of lime juice and 1 teaspoon of lime zest. I like my beef medium rare. Medium is pushing it. Anything beyond medium, and we can’t be pals. (I jest). Delicious carne asada tacos drunk on IPA! Mix the dry rub ingredients together until well blended and massage the dry rub into the flank steak (both sides). Place the steak in a container, and pour the IPA over the steak. 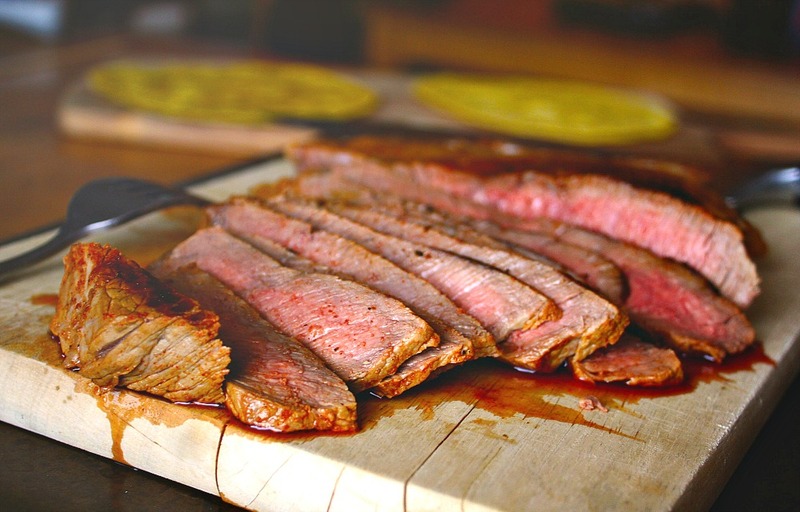 Grill the flank steak to your preference of doneness. 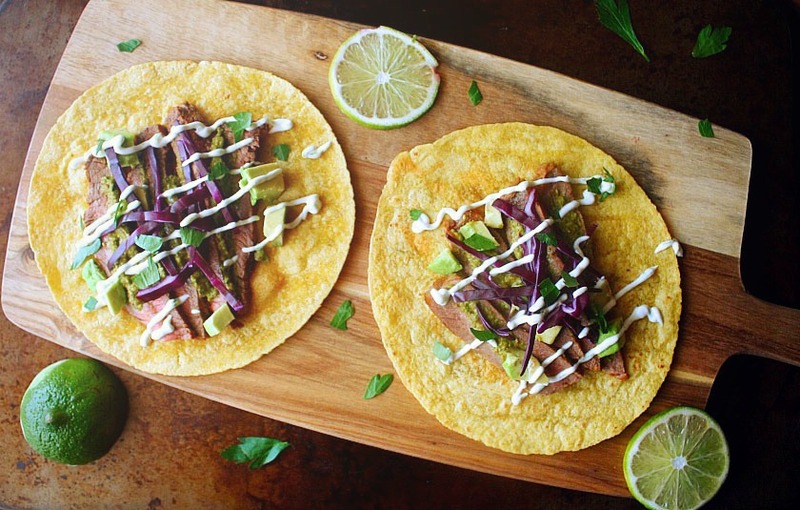 Slice the steak thin, against the grain, and serve on soft-shell corn tortillas with your preference of toppings. Lime Sour Cream: Simply mix 1 tablespoon of lime juice and 1 teaspoon of lime zest to every 1/2 cup of cour cream. does it have to be grilled? i live in a small apt with no grill. Hey Ashley! Not at all. Pan sear it and you should be totally fine. Good luck! I love some good puns :) These look delicious and I'm really looking forward to testing out the IPA marinade! Hi Caitlin! Thanks for the comment - I love people who love some good puns :P Let me know what you think when you do! I don't drink IPAs often (I need to work on that) but they certainly marinate meat well! What can I use in place of the beer? Anything non-alcoholic? You could use any beef marinade, really. Then they are just carne asada tacos, minus the IPA. Camille, thanks so much for stopping by and commenting! I appreciate the kind words and I'm so glad that you've been enjoying my blog :) I'm definitely going to check yours out - right now! I'm all about sharing the blog love with fellow bloggers!